Hey guys! I will be at the Boracay to get sporty! 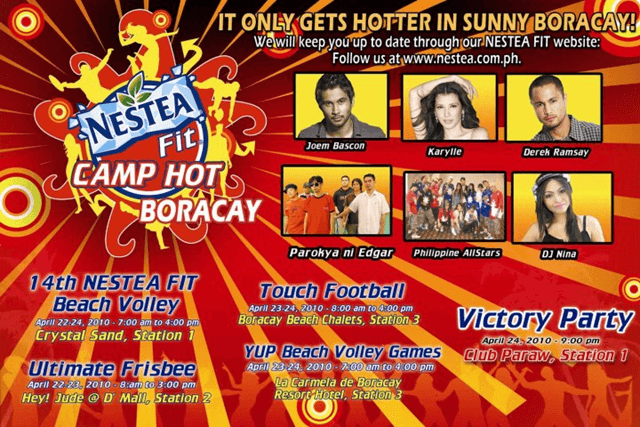 I will be off to witness the Nestea Fit Boracay happening from April 22-24, 2010. Or, if Boracay is getting boring for you, check out the different sporting events by Nestea Fit and watch the Nestea Fit Camp Hotties get athletic. Derek Ramsay, Karylle, Joem Bascon, the Philippine All-Stars, DJ Nina, Jam 88.3’s the Fratpack, the 10 NESTEA FIT Camp Hotties, Sizzling hot action from local and international teams for Ultimate Frisbee, and Touch Football, the 14th NESTEA Beach Volley and Parokya ni Edgar. BORACAY is now sizzlinâ€™ hot with stars! Iâ€™m so excited! Itâ€™s going to be so much fun! Hit â€œPlayâ€ below to view my livestream updates â€“ REAL TIME! Live blogging because I love technology! Check out the Nestea Fit Camp Website for more information.